Meet the adorable Alyce (LOVE this name for a little girl!) and her mom and dad. Alyce is such a happy and expressive little girl. We stuck around downtown Grand Forks for this session and had a lot of fun with this family. I'm heading out of town today for a quick holiday shopping trip, but here are a few images to hold you over 'til I officially kick off family session week (month!) here at the blog tomorrow! 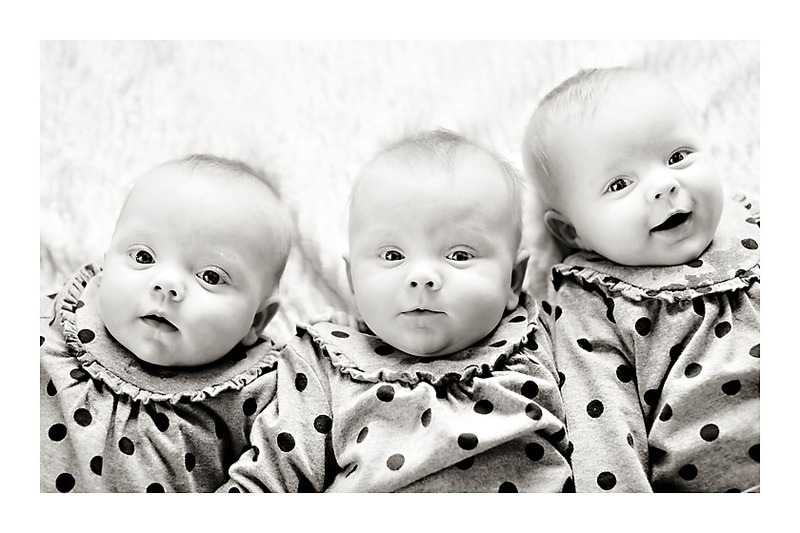 Don't you just love a cute set of triplets? When I first met Mike and Angie to talk about their wedding day plans, I swear we could've chatted the whole night. They are a very friendly, genuine couple that get along fabulously. Mike proposed to Angie just last summer (summer 09) so they planned the wedding in four short months. The couple was married during an emotional ceremony at Holy Cross Lutheran Church. The reception was held at the new Hilton Garden Inn in Fargo. It was a pretty cold day, but Angie and Mike's wedding party was up for the challenge of outside photos! We took most of the couple and wedding party portraits before the ceremony (because it's so dark by 5pm in the winter!). After the ceremony, we quickly ran over to the Christmas tree lot outside of the church for a few more photos of the couple. It was FREEZING by then but Angie and Mike were troopers! This is not the most exciting photo, but I just loved the idea of using eucalyptus in the church decorations. It smelled lovely! Nadine and Chris were incredibly relaxed and cool the whole day -- but I have a feeling that's just how they always are. My favorite quote from the day came from Nadine when the make-up artist asked what color lipstick she usually wears. She said, "Is Burt's Bees a color?" This laid-back couple tied the knot at Holy Cross Lutheran Church in West Fargo and celebrated with their family and friends at the Doublewood in Fargo. Growing up Nadine always wanted a red wedding, so the color red was incorporated into all aspects of the wedding. Even her dress and veil had bits of red. I love that she had a childhood dream of what her wedding would be and made it happen! Nadine is a graphic designer so she had fabulous programs and decor at the reception. And I loved the different layers of her flowers. So pretty! I love that pop of red in her dress! Only three wedding posts left for the year! Despite a minor dress snafu at the beginning of the day that set the schedule back, we were still able to squeeze in a few fun group + couple-only photos before the ceremony. Carrie and Steve's ceremony took place at the historical courthouse. It was a sweet, beautiful ceremony (made complete with a harp player softly plucking throughout). After, we traveled around Stillwater with the wedding party for a few more photos then moved on to the reception in Woodbury.